Carl Ackerfeldt has a solid reputation as one of the finest singers in Sweden. He sang Papageno in The Magic Flute at the Malmö Opera conducted by Leif Segerstam, a role that he also performed at the Royal Opera in Stockholm with Lawrence Rennes and at the Oslo Opera conducted by Michael Pavelich, and has sung Brahms’ German Requiem in the stunning Malmö Live concert hall, with the Symphony Orchestra of Malmö and Marc Soustrot. 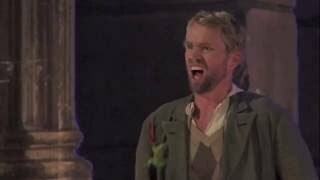 He has sung Christano in Un ballo in Maschera at the Royal Opera in Stockholm and at the Drottningholm theatre Carl sang Papageno, then under the baton of Daniel Harding as a part of the Baltic Sea Festival. In 2014 he participated in a concert performance of Bernstein’s Trouble in Tahiti with the Gothenburg Symphony and Kent Nagano. Carl is a sought-after concert singer in works like Larsson’s God in disguise, Mendelssohn’s Eliah and St Paul, Brahms’ Requiem, Fauré’s Requiem, Mozart’s Requiem, Haydn’s The Seasons and the Passions by J.S. Bach. Carl Ackerfeldt sings Mozart's aria Papagena! Papagena! Papagena!